Considering the new social forums available at the click of a button, the world is able to see powerful images like the one above. Depending on your perspective this image may mean different things and have varied implications. To be able to decipher images, one must employ the use of Semiotics, which refers to the study of signs and symbols in producing meaningful communication. Firstly, one must observe the signifier, which is the basic physical image on the page. In this case, one can see a mother holding her son in a poverty stricken area after the crisis in Singapore. Furthermore, a number of hands giving the thumbs up to the pair with the caption “Liking isn’t helping”. In short, this is the literal meaning, the denotation of the image. Moreover, it is an advertisement for volunteering for the crisis, as evidence in the caption “As a volunteer”. However, to honestly gain meaning from this image one must look at the signified and the all of the connotations linked to the image. The signified refers to meaning or idea expressed by the image. In this case, there is certainly a negative connotation in regards to the lack of action and how middle America act like they care, but do nothing to help. This idea is echoed by Cosmopolitan contributor Frank Kobola who stated in regards of Crisis Relief “a nonprofit that helps the disadvantaged in times of crisis, is asking everyone to do more than just like a status on Facebook”. . However, if a person wasn’t familiar with facebook they might interpret this image as a message of support, not of condemnation. The average Facebook user sets aside 15 hours a month to like a crisis story while volunteer percentages in America decline. As you can observe in the last 10 years Amercian volunteers have reduced by almost 4%. This decline can be attributed the access of information facebook users hold. Considering people can now read or like most stories easily, they believe they have done their part by simply endorsing the issue. People no longer what to be tied down by association with organizations. Wendy Spencer chief executive of the Corporation for National and Community Service shares this opinion. She stated, “Not everyone wants to be formally connected, we welcome spontaneous volunteerism”. Crisis Relief Singapore, 1999. Jakarta 24-28 May 2014. CRS Website. Available from: http://www.crisisrelief.org/ [Accessed March 21, 2016]. Murphy, N., 2015. 3 Disturbing Facts About Volunteering in America. The Cheat Sheet. Available from: http://www.cheatsheet.com/business/why-a-drop-in-volunteering-is-bad-for-everyone.html/?a=viewall [Accessed March 21, 2016]. Jacobsen, T., 2012. Is social networking making us all lazy? Is Social Networking Making Us All Lazy? Available from: http://www.chicagonow.com/when-you-put-it-that-way/2012/02/is-social-networking-making-us-all-lazy/ [Accessed March 21, 2016]. Dvorak, J.C., 2013. Do Facebook ‘likes’ mean anything? MarketWatch. Available from: http://www.marketwatch.com/story/do-facebook-likes-mean-anything-2013-01-18 [Accessed March 21, 2016]. Kobola, F., 2014. 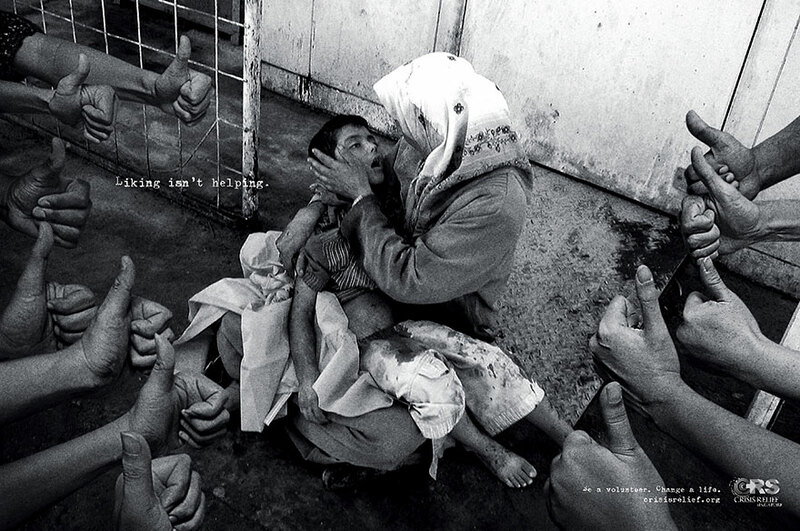 Powerful Images Prove That Facebook Likes Aren’t Really Helping. Cosmopolitan. Available from: http://www.cosmopolitan.com/politics/news/a33613/crisis-relief-singapore-new-ad-campaign-liking-isnt-helping/ [Accessed March 21, 2016]. Very powerful imagery indeed and I completely agree that depending on your perspective, the meaning you get out of a media text may be different to others. In my blog I go to the extreme in saying that the audiences interpretation becomes the meaning, and that the encoders intended meaning may not always be what is discerned. I took a look at “Rage the flower-thrower” a piece created by graffiti artist Banksy, and you can really see that any media text can have multiple meanings.